Today, I'm happy to welcome Naya Nikki to Girl Who Reads. 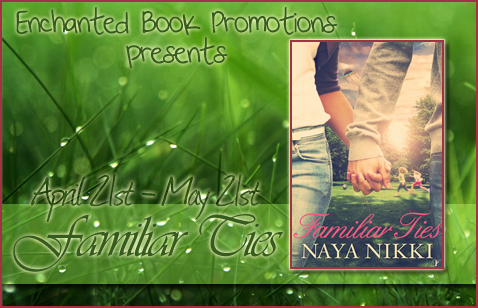 She is currently promoting her new novel Familiar Ties which comes out May 21st from InkSpell Publishing. To see my thoughts on Familiar Ties, see my review here. Give a warm welcome as Naya shares her favorite characters and then read an excerpt to get a glimpse of the characters. My favourite character will always be Little Miss Gracie. She is stuck between wanting a proper family with her Mum and Dad yet secretly wanting her mum and Uncle Max get together. She was the most fun to write because she is so curious and fiercely independent at such a young age, however she still wants to follow in the footsteps of her best friend. I also love Grace’s chemistry with Max and Jack, because you can see that even though one is her father and the other is an Uncle she has completely different relationships with each of them, and you get to see who she is more comfortable with. However my favourite character to write was Max as he holds a soft spot in my heart as many of his characteristics were based on my own dad. Also his relationship with Phoebe and Grace is much like mine with my dad so it was fun to write about him, so that everyone can see how wonderful he is. About the Author: Born and raised in London, England, Naya Nikki is a student who’s spent most of her life taming her creative streak through writing short stories. She’s signed her first contract with InkSpell Publishing to publish her first book “Familiar Ties.” The story follows the journey of two single parents whose daughters want nothing more than for them to become a happy family. She is currently earning a degree in English with a minor in Creative Writing that will allow her to build her writing career. When she isn’t at the university, Naya loves nothing more than spending time with her parents and grandparents as well as meeting her friends for gossip sessions over some hot cocoa. “Yes, I know,” she replied. “Because that’s how you got Anna to fall for you.” She was about to laugh when she realized what she’d said. There was a moment of silence as both contemplated the loss of Anna. “Sorry,” she whispered to him. “I shouldn’t have said that." This looks interesting. I've never heard of this book or this author.